Classic elegance is achieved with the design of the VanBure Collection. 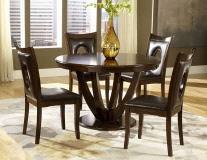 The tabletop features book-match veneers and is gracefully supported by the stately table base. The coordinating chairs feature an oval cutout accent, wood framing and dark brown bi-cast vinyl seating. The entire collection is finished in a rich cherry, further lending to the elegant design.